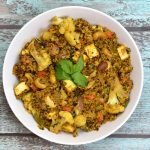 Quinoa Vegetable Biryani or Pilaf (pulao) is my healthy twist on a popular Indian classic, Vegetable Biryani! 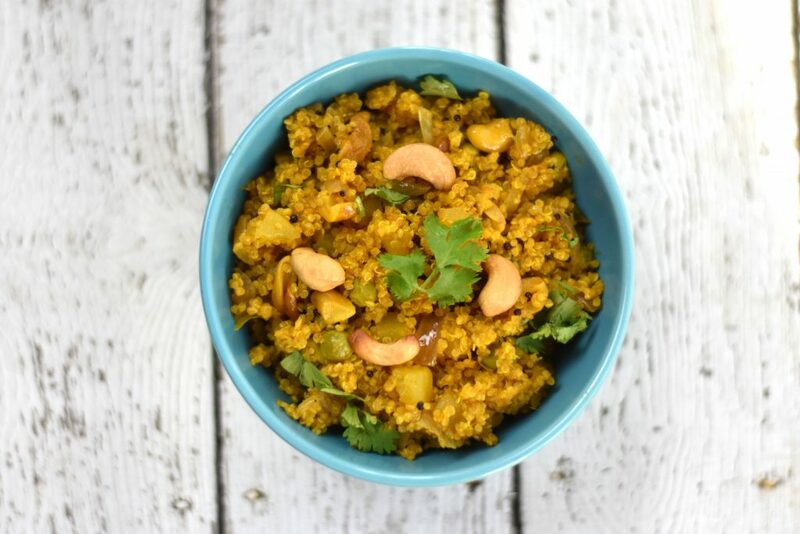 This quinoa recipe is an adaptation of my go-to Biryani recipe. Biryani is a popular Indian rice casserole, where long grain basmati rice is cooked with meat or vegetables in Indian spices. I use the same recipe, but replace Basmati rice with Quinoa. I add vegetables and paneer (Indian cottage cheese), adding more protein and vitamins to this dish. Fresh herbs like mint and cilantro add a fresh and floral contrast to the earthy flavors of Biryani Masala. Nuts like almonds and cashews add richness and texture to the rice. I serve it with a side of Cucumber Raita (Yogurt dip), and enjoy a healthy and complete meal in less than 20 minutes. , so a big one-pot weeknight hit in my family! 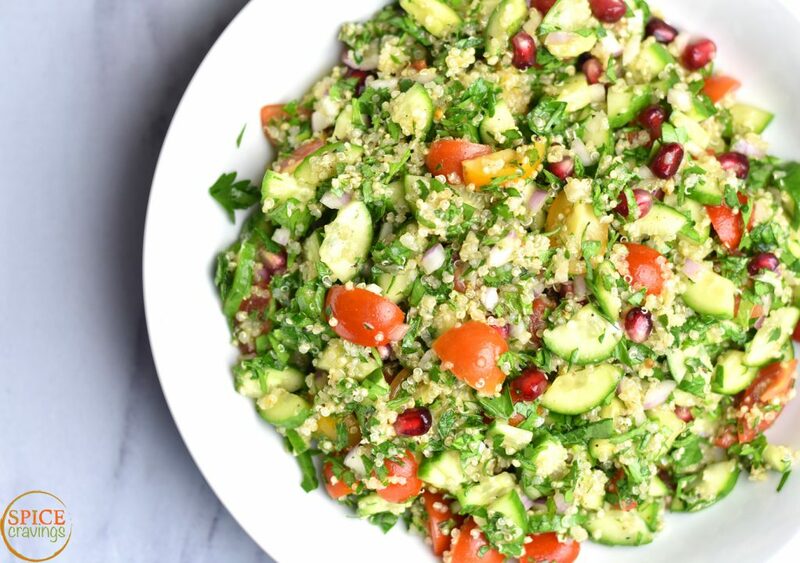 Quinoa is perhaps one of the most popular super foods of this decade. It’s a seed, not a grain, which makes it gluten-free. 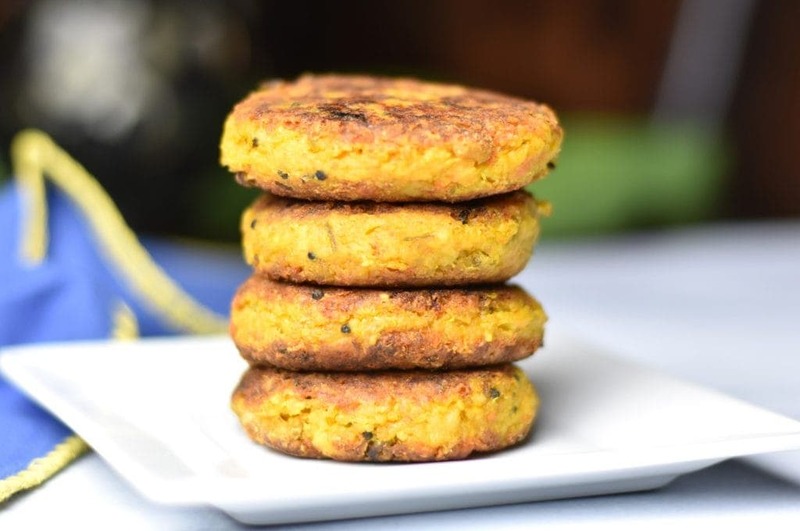 It is high in protein, fiber, amino acids and a great source of minerals. Quinoa’s higher protein and fiber content makes it a popular and healthy substitute for many grains like rice, wheat, pasta etc. As a family, we have been trying to make better food choices and make our meals more balanced and healthier. With the focus on high-protein-lower-carbs, I have been experimenting with my family’s favorite biryani recipes. Over the last year or so, we have been substituting Quinoa for rice in many dishes. Even though Quinoa still contains carbs, it is a better and healthier choice for my family. As you can see, Quinoa is high in fiber, which brings the net carb count down. 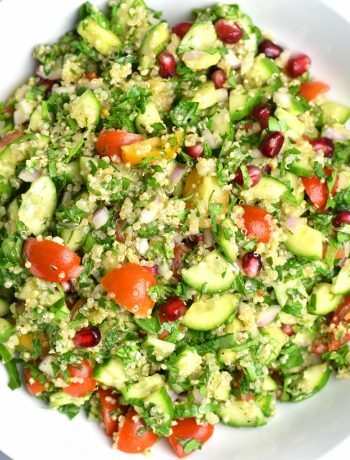 The higher fiber and protein content means we feel satisfied or full in a lesser quantity of quinoa vs rice. I can eat a cup of cooked rice very easily, but I can rarely eat more than 1/2 a cup of cooked quinoa. Also, since it is high in protein, it slows down the process of carb absorption in the body vs. rice, which gets processed as a simple carbohydrate. Of course, this analysis is based on the research I have done for my family and should not be used as professional advice. 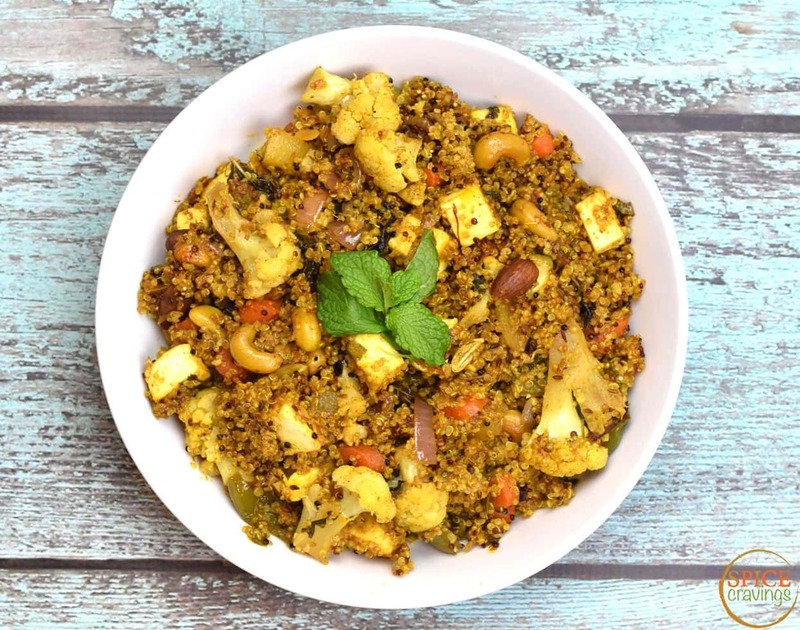 How to Customize Quinoa Vegetable Biryani Pilaf? This veg biryani recipe is easily customizable. 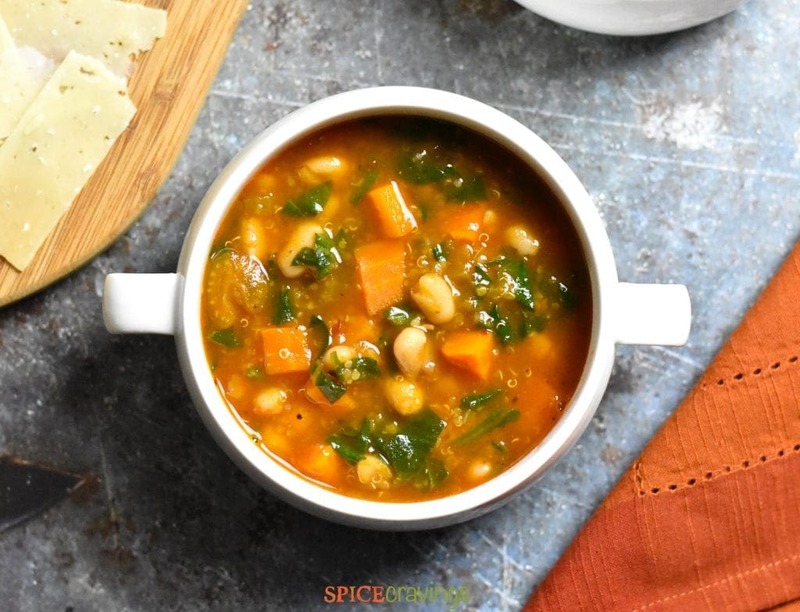 Add your choice of vegetables, switch the protein and season it with your favorite spice blend. You can add shrimp to this dish and make a Quinoa Shrimp Biryani, following the same timing and directions. If you can add diced chicken pieces, simply increase the cooking time to 4 minutes and enjoy a fantastic Quinoa Chicken Biryani. We enjoy pairing this quinoa vegetable biryani with cucumber raita (yoghurt dip), or with a quick onion relish. You can make the onion relish by mixing together sliced onions, red wine vinegar, salt, pepper and cayenne! 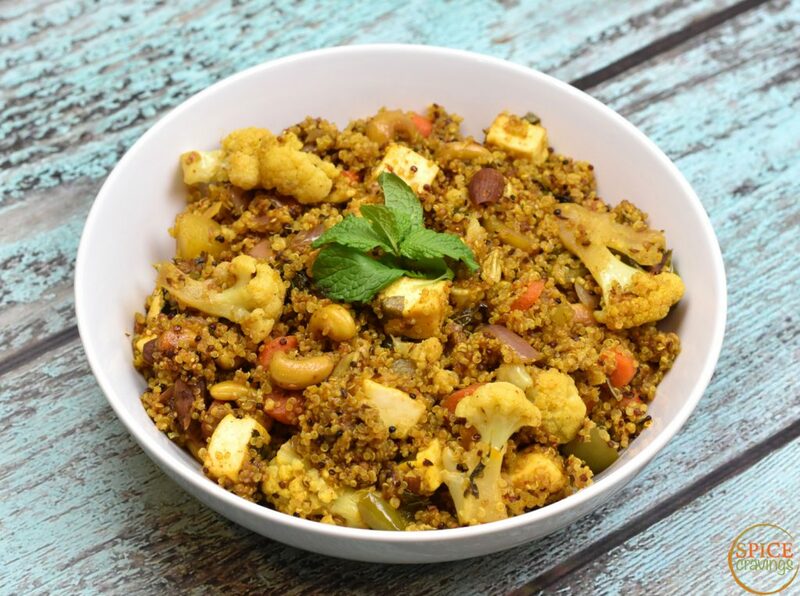 Quinoa Vegetable Biryani is my healthy twist on a popular Indian classic, Vegetable Biryani. 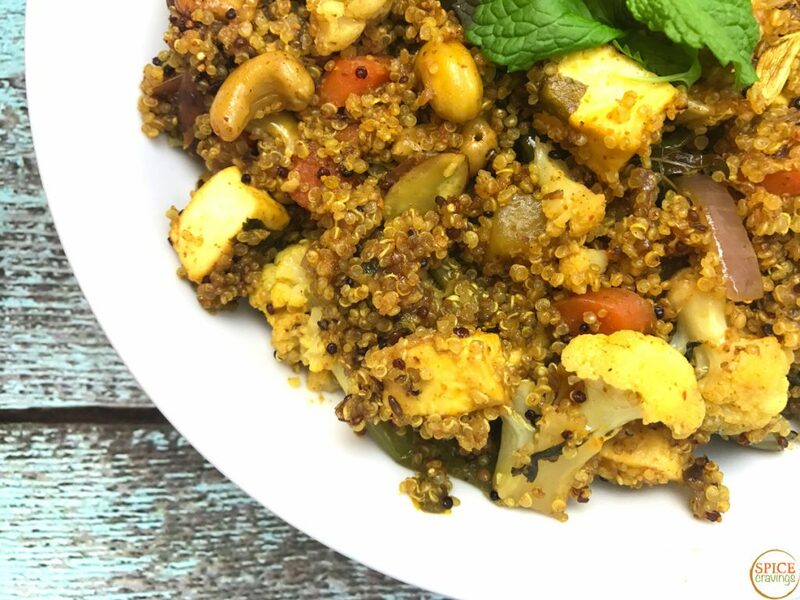 I replace rice with quinoa in this recipe and add vegetables and paneer with a biryani masala mix for a tasty and sumptuous meal. 2 cups assorted vegetables of your choice. I used cauliflower, bell peppers, and carrots. Prep: Cut assorted vegetables of your choice in bite size pieces. Cube paneer in 1/2 inch pieces. Crush 1/2 inch ginger+ 3 garlic cloves and keep aside (if using fresh). Turn instant pot on Sauté. Wait 30 seconds and add cumin seeds. When cumin seeds begin to sizzle, add ginger-garlic paste and sauté for 30 seconds. Add almonds and cashews and sauté another 30 seconds. Add vegetables and paneer, Biryani masala (see 'notes' for substitute for masala blend) and quinoa. Then, add water and stir well. Top with fried onions, saffron strands and chopped cilantro-mint. Close lid. Set valve to Sealing. Press Manual (hi) for 1 minute. After natural pressure release, NPR, open lid. Using a fork, gently fluff the biryani. Serve with raita or your favorite condiment. If your quinoa brand takes longer to cook, adjust the pressure cooking time to 3-4 mins. I am excited to make this with shrimp. Does this change to amount of liquid or the time to cook? Hi Poornima, Shrimp sounds wonderful in this recipe, I have yet to try that. Time and liquid would be the same. I would QR after cooking to prevent the shrimp from over cooking. Would love to hear how it turned out! This looks scrumptious. 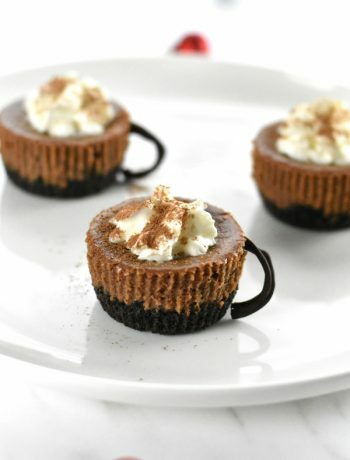 Going to have to make this soon. Thanks for sharing! Thanks Yasmin! This is a regular in my home now! Would love to hear how you liked it!